The PASRR Phase 2 training webinar recording and slides everyone is asking for are now available in the SimpleLTC PASRR Resource Center. Beginning June 27, 2014, all Texas nursing facilities became subject to new Phase 2 requirements for the Texas Medicaid PASSR Level 1 (PL1) process. Facilities that do not properly follow the new procedures will see a negative effect to their LTCMI and reimbursement processes. On June 17, 2014, SimpleLTC hosted a PASRR Phase 2 training webinar, in conjunction with DADS, for all Texas nursing facilities. The response to this important information was overwhelming: more than 1,000 long-term care professionals registered for the training. Due to popular demand, we’ve now made the webinar and slides available to all Texas facilities. This is your chance to stay ahead of the change and protect your reimbursement. Check out the PASRR training now. 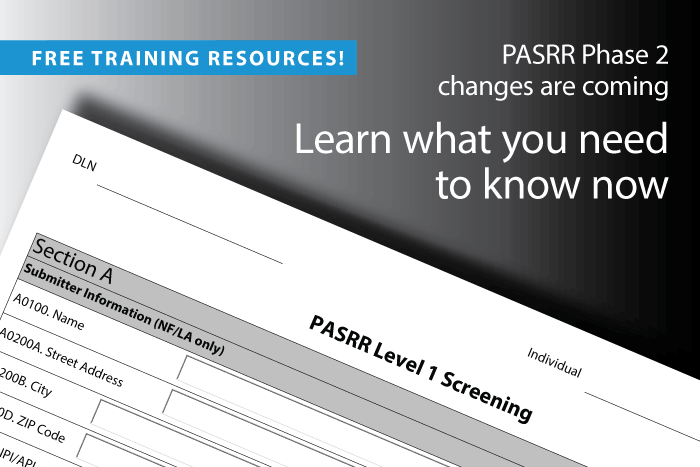 What are the PASRR Phase 2 changes and how will my facility be affected? How might these changes affect my LTCMI and reimbursement? Why is the redesign necessary and what changed in Phase 1? How do I manage the new alerts? We’ve updated the slides to cover some of the top questions during the webinar, including the specific definitions of Mental Illness (MI) and Intellectual Disability (IDD), and what to do in case of a non-compliant referring entity. Participants asked over 200 questions during the webinar and we have worked with DADS to get answers to all of them. You’ll find a link to the detailed FAQ on the training page. Please pass along this information to all your colleagues who are responsible for Texas Medicaid. Thank you!